David Tennant to be a guest on the television show Room 101. The recording will take place on Tuesday 27th October at Elstree Studios in Hertfordshire. No broadcast date is set yet. French television channel TF1 will film an adaptation of The Escape Artist with Gregory Fitoussi (Spiral). ScreenCrush has reported a RUMOUR that David Tennant has been seen on the set of Luke Cage (Marvel's follow-up to Jessica Jones). However there is no photographic evidence. Broadchurch original season is repeated in Germany from tonight. David Tennant Daily News Digest for Tuesday 29th September 2015 (7 items). David Tennant has provided the voiceover for a new The Scotsman promotional video. Doctor Who: Christmas Specials Boxset to be released in the US on DVD and Blu-ray on Tuesday 24th November. Doctor Who: The 10 Christmas Specials to be released on Monday 19th October on DVD and Blu-Ray in the UK. 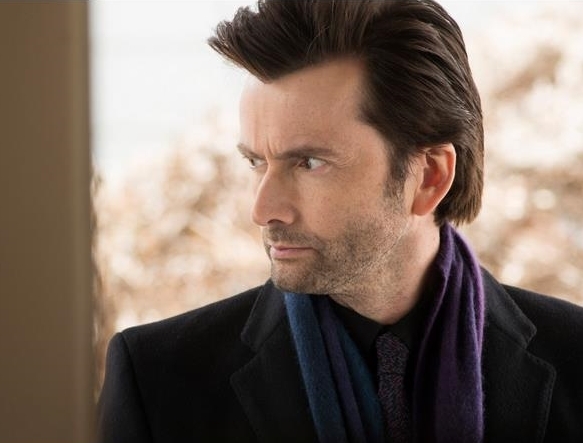 GQ lists David Tennant as one of the reasons people should watch Marvel's Jessica Jones. LEGO Dimensions (Doctor Who) game starter pack is launched today in the UK. David Tennant Daily News Digest for Monday 28th September 2015 (3 items). As tomorrow marks 100 days until David Tennant's return to Richard II, we will start our popular theatre countdown each day at 8am on Twitter! David Tennant Daily News Digest for Sunday 27th September 2015 (4 items). LEGO Dimensions game (Doctor Who) starter pack is launched today in the US. Episode two of Broadchurch Season Two is on MTV3 tonight in Finland. David Tennant Daily News Digest for Saturday 26th September 2015 (4 items). Episode four of the French language version of Broadchurch Season Two premieres on ICI Radio-Canada T�l� tonight. The first official footage of Marvel's Jessica Jones has been added to YouTube (unfortunately David Tennant is not shown). David Tennant Daily News Digest for Friday 25th September 2015 (4 items). 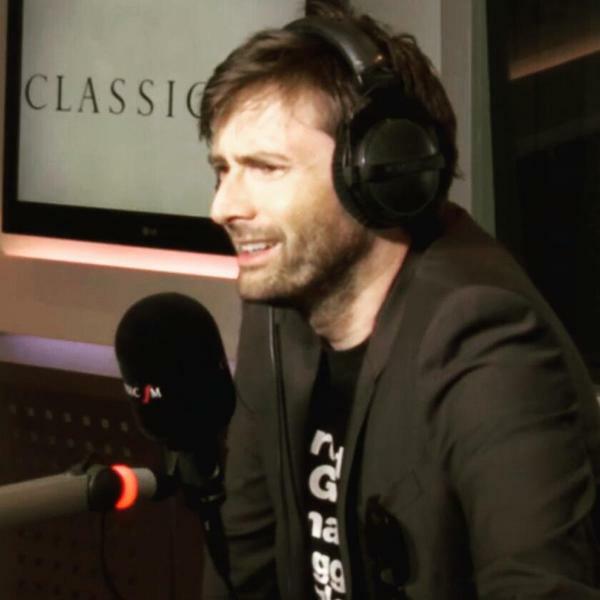 David Tennant is the narrator of a play in aid of Classic FM's charity Global's Make Some Noise. The play is titled Upstairs Downland Abbey and a brief interview with David was broadcast today on Classic FM to announce the project. Photos of David at Classic FM and a video of him recording the play. Link to a MP3 of the interview. What We Did On Our Holiday is released in Taiwan today. It is known as This Summer's Secret in the country. David Tennant Daily News Digest for Thursday 24th September 2015 (5 items). 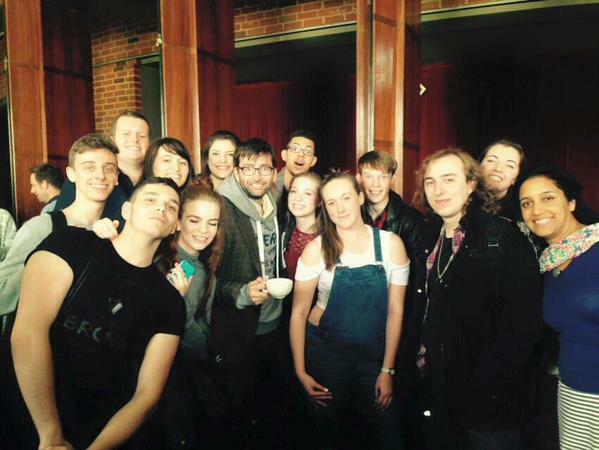 Today David Tennant presented certificates and attended an event for RSC Education in Stratford-upon-Avon. A photo of him with students was posted to Twitter. Kasterborous reports that Marvel's Jessica Jones will be available on Netflix in the UK at 8.01am on Friday 20th November. What We Did On Our Holiday is released in cinemas in Portugal today. David Tennant Daily News Digest for Wednesday 23rd September 2015 (4 items). Broadchurch Season Two will premiere in Germany on pay-television station 13th Street at 9.50pm on Monday 30th November. David Tennant and all the cast of Marvel's Jessica Jones will appear at the New York Comic Con on Saturday 10th October. David Tennant Daily News Digest for Tuesday 22nd September 2015 (4 items). 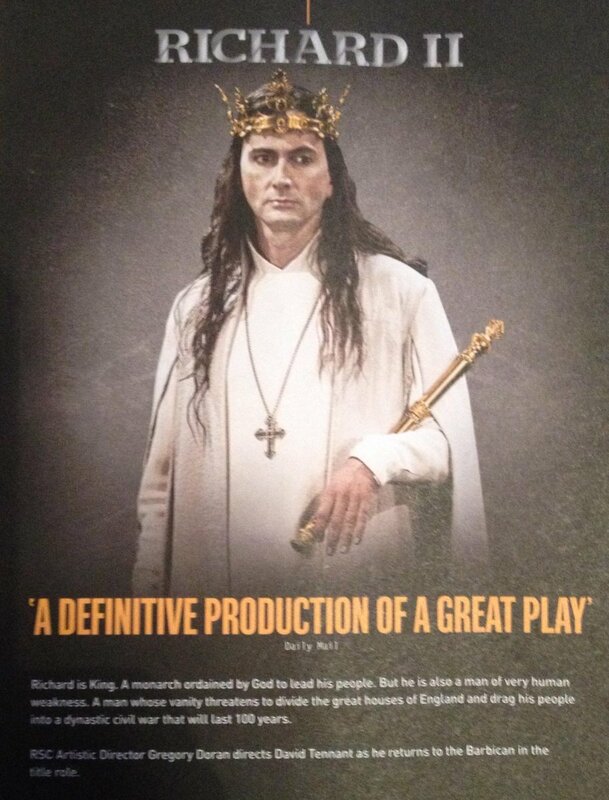 David Tennant / Richard II page from a RSC mailing about the King And Country Cycle. On ITV's 60th anniversary, Broadchurch is listed in The Telegraph's Top 60 ITV Shows (at #54). DVD of French dubbed version of What We Did On Our Holiday is released in France today. Gracepoint concludes tonight when episodes 9 and 10 are broadcast on 13th Street in Australia at 8.30pm tonight. David Tennant Daily News Digest for Monday 21st September 2015 (4 items). A video of David Tennant's part of Teenage Mutant Ninja Turtles ("Hurry! We haven't much time!") has been added to YouTube. David Tennant's Fugitoid makes an unannounced appearance in Season Three finale of Teenage Mutant Ninja Turtles. David Tennant Daily News Digest for Sunday 20th September 2015 (6 items). MP3 of Caesar! Peeling Figs For Julius. Gay Times magazine has issued a Doctor Who special digital download magazine which includes a David Tennant interview. Broadchurch Season Two starts in Finland on MTV3 tonight. David Tennant Daily News Digest for Saturday 19th September 2015 (6 items). David Tennant's voice was briefly heard and he was shown on a screen in the Doctor Who episode The Magician's Apprentice tonight. Space in Canada broadcasts five David Tennant episodes of Doctor Who today. Episode three of the first French broadcast of Broadchurch Season Two in Canada is on the station ICI Radio-Canada T�l� tonight. To celebrate the start of Doctor Who Series Nine tonight, here are some photos of David Tennant filming Tooth & Claw. David Tennant Daily News Digest for Friday 18th September 2015 (5 items). David Tennant will voice Fugitoid in 13 episodes of Nickelodeon's Teenage Mutant Ninja Turtles Season Four. The Press Association reports that the four most watched Doctor Who episodes since 2005 all starred David Tennant. 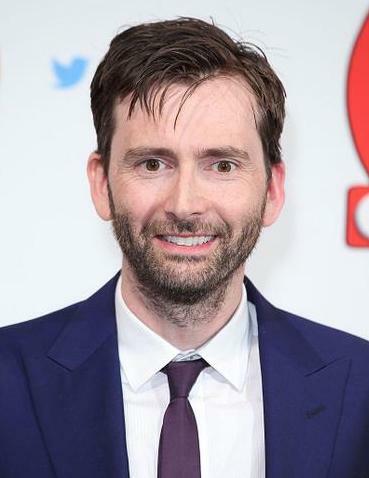 David Tennant has been voted Most Popular Doctor in a poll of 16,000 Digital Spy readers. He won with 2.8K votes. David Tennant Daily News Digest for Thursday 17th September 2015 (5 items). The first official photo of David Tennant from Marvel's Jessica Jones has been released today by Netflix. Broadchurch Series Two has been voted Best Mystery in the inaugural fan-voted Yahoo Awards with 44% of the total votes. The premiere broadcast of Broadchurch Season Two in Sweden concludes tonight on TV4. David Tennant Daily News Digest for Wednesday 16th September 2015 (6 items). Broadchurch Season Two starts in Finland on MTV3 on Sunday. What We Did On Our Holiday is now released on DVD in South Korea. Broadchurch original series is repeated on ITV Encore starting tonight at 11pm. Issue #1 of Doctor Who Tenth Doctor Adventures comic (year two) is released today. David Tennant Daily News Digest for Tuesday 15th September 2015 (5 items). BBC America in the US has a day of 22 David Tennant episodes of Doctor Who starting at 6am tomorrow. Photos of David Tennant in TV Choice magazine this week. Gracepoint episodes 7 and 8 are on 13th Street in Australia at 8.30pm tonight. David Tennant Daily News Digest for Sunday 13th and Monday 14th September 2015 (5 items). Tickets for David Tennant's Richard II panel at The Barbican go on sale to the public today. David Tennant Daily News Digest for Saturday 12th September 2015 (5 items). A trailer for Broadchurch Season Two in French (which premieres tonight in Canada) has been posted to Facebook. The first French broadcast of Broadchurch Season Two in Canada starts on the station ICI Radio-Canada T�l� with the first two episodes shown from 8pm. David Tennant Daily News Digest for Friday 11th September 2015 (6 items). Also a clip of the Netflix series will be shown. Episode eight of the French language Broadchurch Season One repeats on ICI Radio-Canada T�l� tonight at 11pm. Peter And The Wolf And Jazz CD (narrated by David Tennant) is released today in the US. RSC Supporters and Members priority booking for David Tennant's Richard II Panel opens today at 10am. David Tennant Daily News Digest for Thursday 10th September 2015 (5 items). Marvel's Jessica Jones will premiere on Netflix on Friday 20th November. A trailer has been posted to YouTube announcing this today. Doctor Who Comic issue #8 is released today in the UK. Episode seven of Broadchurch Season Two premieres in Sweden on TV4. David Tennant Daily News Digest for Wednesday 9th September 2015 (5 items). David Tennant to take part in a Richard II panel on Saturday 16th January in London. Issue #5 of Doctor Who: Four Doctors Summer cross-over comic (the final issue) is available today. Issue 1 of Doctor Who: The Complete History is published today in the UK. It features five David Tennant episodes. David Tennant Daily News Digest for Tuesday 8th September 2015 (9 items). A video of David Tennant taking a photo of Lenny Henry and Danny Miller at the TV Choice Awards last night has been posted to Twitter. David Tennant's acceptance speeches at the TV Choice Awards last night. More photos of David Tennant at the TV Choice Awards last night. A photo of David Tennant (holding his award) with Kirsty Porter of Hollyoaks at the TV Choice Awards last night has been posted to Twitter. A photo of David Tennant with Danny Miller of Emmerdale at the TV Choice Awards last night has been posted to Twitter. Gracepoint episodes 5 and 6 are on 13th Street in Australia at 8.30pm tonight. David Tennant Daily News Digest for Monday 7th September 2015 (8 items). A clip of David Tennant and Lenny Henry taking a selfie was posted to Twitter. 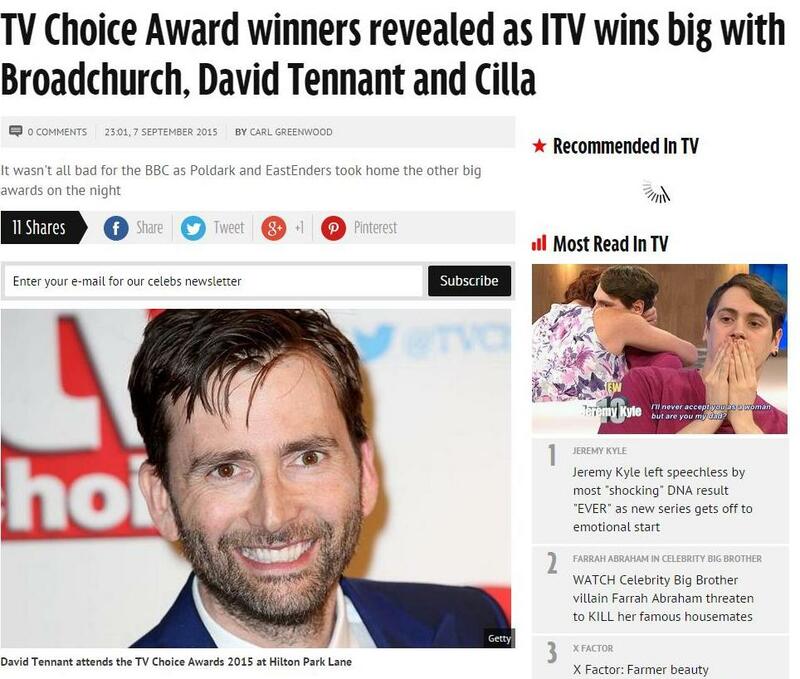 David Tennant won the Best Actor Award (for Broadchurch) at the TV Choice Awards tonight!!! When David collected the award he thanked writer Chris Chibnall and said "without whom we'd be wandering around under a cliff with nothing to say!" Unfortunately W1A did not win the Comedy Award at the TV Choice Awards as Benidorm won. Photos of David Tennant arriving at the TV Choice Awards tonight. 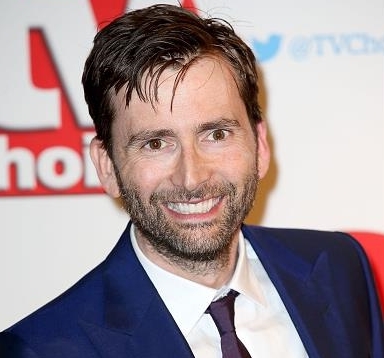 TV Choice Awards are announced tonight: David Tennant, Broadchurch and W1A are nominated. David is 'expected' to attend. David Tennant Daily News Digest for Sunday 6th September 2015 (5 items). BBC America has a day of 22 David Tennant episodes of Doctor Who on Wednesday 16th September. Episodes seven and eight of Broadchurch Season Two premieres in Poland on Ale Kino+ tonight. Watch has another afternoon of David Tennant episodes of Doctor Who today. David Tennant Daily News Digest for Thursday 3rd to Saturday 5th September 2015 (11 items). Doctor Who: The Doctor's Finest is on BBC America tonight with The Day Of The Doctor. Episode seven of French language Broadchurch Season One repeats on ICI Radio-Canada T�l� at 11pm tonight. 96 Ways To Say I Love You screens at Cambridge Film Festival today. Radio Times has a fun article titled 16 signs David Tennant is YOUR Doctor. Episode six of Broadchurch Season Two premieres tonight in Sweden on TV4. David Tennant Daily News Digest for Tuesday 1st and Wednesday 2nd September 2015 (10 items). Zap2it rates David Tennant as the best modern Doctor. The article also includes a poll. What We Did On Our Holiday will be released in cinemas in Portugal on Thursday 24th September. Krysten Ritter has some lovely words to say about working with David Tennant on Marvel's Jessica Jones. Peter And The Wolf And Jazz CD (narrated by David Tennant) to be released in the US and the UK on Friday 11th September and Friday 2nd October respectively. Issue #4 of Doctor Who: Four Doctors Summer cross-over comic is released today. Radio Times reports that a clip of David Tennant is included in the compilation show You Saw Them Here First: Hall Of Fame on ITV tonight at 8pm. David Tennant Daily News Digest for Saturday 29th to Monday 31st August 2015 (9 items).